A few weeks ago, Harvard’s Berkman Center for Internet and Society released a report that documents the achievements of Holyoke Gas & Electric (HG&E) Telecom, a municipal electric utility that now provides fiber-optic broadband Internet to local businesses in several western Massachusetts towns. 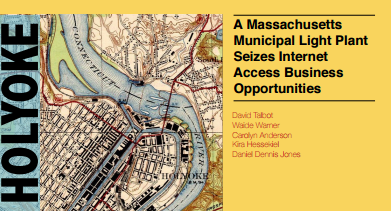 The utility’s move into fiber-optics has led to municipal savings for the City of Holyoke, as well as increased high-speed access in neighboring cities, and driven economic development. We interviewed Holyoke's Senior Network Engineer, Tim Haas, in a previous episode of the Community Broadband Bits podcast. Because the state of Massachusetts has no barriers that prevent the creation of municipal Internet networks, HG&E has been able to compete on a level playing field with incumbent ISPs Comcast and Charter. HG&E is among 12 MLPs (Municipal Light Plants) out of 41 in the state to offer fiber Internet services. Researchers at the Berkman Center believe that MLPs could play a large role in expanding Internet access and business opportunities throughout the state as electricity revenues experience diminishing returns and data needs grow. For example, HG&E’s fiber connection was a factor in the Massachusetts Green High Performance Computing Center’s decision to open a $90 million data center in Holyoke. HG&E is a somewhat unique municipal network in that it offers services not only in Holyoke, but also in nearby Chicopee. It also assists Leverett and Greenfield with their own networks. In Chicopee, the utility provided fiber access in a collaboration with 35 local businesses. In Leverett, it is managing the municipal network, with services provided by a local private company. As for Greenfield, HG&E now serves as the ISP for City Hall and the city’s police station, both of which will function as Internet access nodes as the town looks to create a fiber and wireless network that extends into homes and businesses. These deals provide modest revenue streams and also illustrate how a MLP telecom division can extend its offerings far beyond the usual geographic boundaries of electricity service. The offering will include optional phone service, but no TV bundle. WGE [Westfield Gas and Electric Department] had rejected the idea of residential service several times over the past 10 years because it would have meant providing TV content. Now, however, on-demand video services are becoming popular. The Berkman Center report, which runs 21 pages, illustrates both the shifting demands for broadband access, as well as a collaborative method for addressing these needs. The hope is that reports of this nature can contribute to an ever-increasing wealth of knowledge with regards to the variety of municipal approaches in play for expanding high-speed, reliable Internet access.